This week.. Facebook lets brands use dynamic ads to drive app installs, Microsoft gets Windows 10 running on mobile, leaks reveal security services have been intercepting in-flight phone calls for years, people opt for mobile banking during cash crunch and much more. Microsoft’s attempts to get into the smartphone business have mostly been a disastrous affair. And for a while it appeared the Redmond, Wash.-based software giant had made its peace, having found a big growth business in the cloud. But it looks like Microsoft is somehow still not quite done with mobile. At Microsoft’s hardware developer conference in Shenzhen, China, the company said that a full-fledged Windows 10 experience will work on upcoming ARM-based processors built by mobile chipmaker Qualcomm. This would mark the first time that the full Windows experience is able to operate on an ARM processor, which run virtually every smartphone in the world. Intelligence agencies including the National Security Agency (NSA) and its British equivalent, the Government Communications Headquarters (GCHQ) have, for years, targeted and intercepted communications from mobile phones that are used on commercial flights. Building on what was already made public in Glenn Greenwald’s book ‘No Place to Hide’, new documents released by The Intercept, based on leaks from Edward Snowden, show how signals intelligence experts can scoop up mobile data from 33,000ft above the earth. A GCHQ presentation from 2012 describes a programme called Southwinds that is allegedly used to collect the data from in-flight communications across the Europe, the Middle East, and Africa region. The file – classified as ‘top secret’ – said spies had “complete access” to mobile activity. Have you ever seen someone’s face and been struck with an overwhelming sense of familiarity but were unable to place them? Well, that could soon change. A new face-reading feature on an augmented reality app called BlippAR has caused controversy and prompted fears about the inevitable demise of public privacy. The app allows users to point their smartphone camera at any object and be given a slew of information about it. For example, you can get information about famous pieces of artwork, a type of dog breed, or point your phone at a product and receive advertisements for it. But it’s the app’s newest feature that has raised eyebrows. The company has included a people recognising capability, allowing the app to recognise faces in real life or in images and videos. 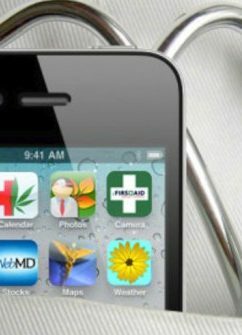 Don’t count on smartphone health apps to help when you’re having a serious medical emergency, warn the authors of a new review of the technology. The study, published Monday in the journal Health Affairs, found problems even with apps considered to be among the highest-quality offerings on the market. The demand for PoS (swipe) machines has increased manifold as people are unable to withdraw cash from banks or ATMs, as per their requirement, due to cash crunch. The long queues outside ATMs and banks seem to be a permanent affair. Demonetisation has also led to public outrage on roads with a number of protests by people outside banks reported recently. Due to heated arguments and even manhandling of some officials, banks are demanding security from the state government. A top priority for marketers in 2017 should be to pay closer attention to the ‘mobile-first’ Generation Z, so called post-millennials and centennials, as brands increasingly must connect with this discerning group. With Gen Z numbers now reaching two billion people worldwide – approximately 27% of the world’s population – a recent report by Kantar Millward Brown suggests that marketers need to develop creative, mobile content that appeals to the emotions of the Gen Z consumer if they want to be accepted by this key group. Back when it became apparent that smartphones were going to be the next big thing in the consumer electronics industry, a lot of existing developers of console and PC games decided to give mobile platforms a chance. However, Nintendo was not one of them. Given how a large part of the company’s revenue was generated by its portable gaming division, it wasn’t surprising that Nintendo wasn’t keen on developing mobile games. Back then, the Japanese entertainment firm firmly believed smartphones and tablets were competing with handheld consoles. However, as of this year, Nintendo finally gave in by releasing Miitomo and Pokemon GO, both to much success and critical acclaim. In fact, the Kyoto-based company is now so confident about its prospects in mobile that it even decided to launch Super Mario Run, a casual auto-runner with a premium price tag. Microsoft has unveiled a new chatbot named Zo, but this time, she’s available on Kik, instead of Twitter, where earlier this year, her predecessor—known as Tay—went on a rather racist tirade before being shut down. I’ve never heard a clear explanation as to why Microsoft is making chatbots, and I have to assume the worst: They are on track to deliver ads. Mobile video ad revenue in China more than doubled over the past year to CNY6 billion ($860 million) in Q3 and accounted for nearly 60 per cent of total online video ad revenue, according to iResearch. A year ago mobile video ads represented 44 per cent of online video ad revenue (see chart below, click to enlarge). The country’s overall online video sector grew 62 per cent year-on-year in Q3 to CNY18.3 billion, with ad revenue accounting for 55 per cent of total online video revenue. Online video ad revenue increased 51 per cent year-on-year in the quarter to just over CNY10 billion. The Beijing-based research firm expects ad revenue to maintain a high growth rate, even as the overall sector starts to slow.